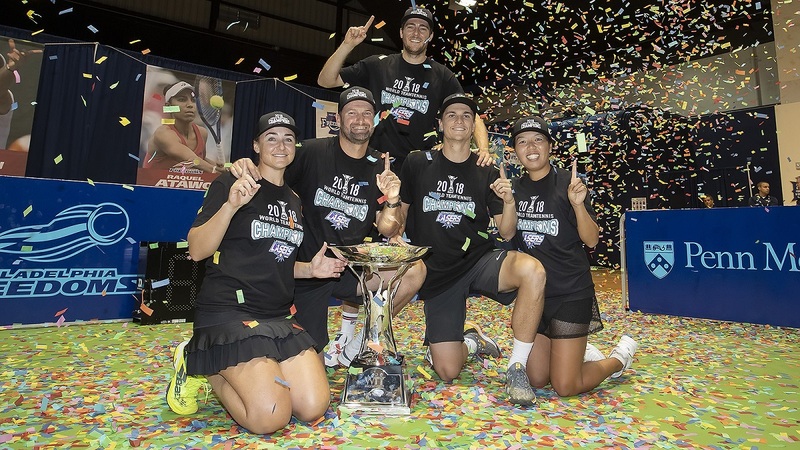 It took 23 seasons but the Springfield Lasers are finally the World TeamTennis champions. Springfield overpowered the top-seeded Philadelphia Freedoms, 19-18, at Sunday's World TeamTennis Finals presented by GEICO on the campus of Drexel University in Philadelphia. Miomir Kecmanovic was the standout for the Lasers, winning four consecutive games in the final set to defeat Kevin King in men's singles 5-3 to bring Springfield back from a 3-game final set deficit. Kecmanovic was named WTT Finals Forevermark MVP and received a one carat Forevermark diamond for his performance. Lasers coach John-Laffnie de Jager dedicated the win to team founder Harry Cooper who passed away earlier this year. "This is for the people of Springfield and Mr. Cooper. I talk about champion people in life and the people in this franchise are all champion people. To win for the people of Springfield means a lot. They have been so good to us and I'm so glad we can bring the King Trophy back to them." Springfield got off to a strong start in a men's doubles battle between Springfield's Kecmanovic and Marcelo Demoliner and Philadelphia's Fabrice Martin and 2018 Male Rookie of the Year Kevin King. The teams traded service holds until Kecmanovic hit a backhand winner down the line to break King's serve and give the Lasers a 4-3 lead. Demoliner held serve as the Lasers won another critical 3-all point to close out the first set 5-3. Overall, the Lasers won six of nine 3-all points during the Finals. Service holds were hard to come by in women's doubles as Philadelphia's Taylor Townsend double-faulted four times during the set and lost serve to hand Springfield's duo of Vania King and Abigail Spears a 4-2 lead. King closed out the set on her serve to give the Lasers a 5-2 win over the League's top-ranked doubles team of Townsend and Raquel Atawo. With a 10-5 lead heading into the third set, Springfield looked to be in control going into mixed doubles. Martin started off with a strong service game and then raised his hands as he called for the crowd to get back into the match. The crowd roared and his Freedoms teammates also answered that call to action. Townsend held serve then Philadelphia won their first 3-all point of the afternoon to break Spears' serve and go up 3-1 in the set. Townsend won her final service game for a 5-2 set win and closed the gap on Springfield's lead to 12-10. Townsend was undefeated during the regular season in women's singles and she kept that record intact against Vania King. As this year's Female MVP took the court, Freedoms owner Billie Jean King encouraged her from her seat in the second level by shouting "you can do it Taylor, you know what to do." Townsend listened, breaking King's serve in the opening game then held her serve to bring the overall match score even at 12-12. King and Townsend traded service holds until Townsend broke King to finish off the set at 5-2 and give the Freedoms their first lead since the opening set, 15-14, going into the final set of men's singles. The last set featured the league's top two men's singles players with Kecmanovic and King holding court with the 2018 title on the line. King saved three break points in the opening game and jumped out to a 3-1 lead but it was all Kecmanovic after that as the 18-year-old Serbian ran off four games in a row to win the match and set off a celebration as the Lasers bench rushed the court under a shower of confetti. "It was a tough situation," said Kecmanovic. "I tried to stay calm and I thought I could still do it. In the end I somehow managed to come through."